Corinthian clubs are invited to take part in this summer's EAL 6-a-side Summer League at Noak Hill, starting on Monday 3rd July. 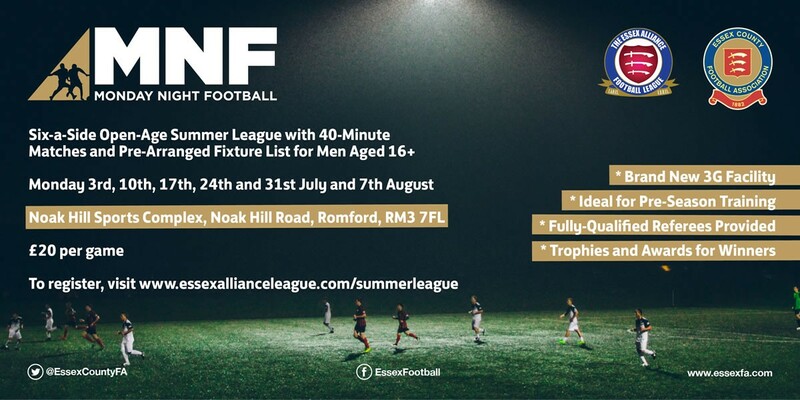 The league, which is being run in partnership between the Essex Alliance Football League and the Essex County FA, are inviting sides to register for an exciting Monday night football competition which takes place for 6 weeks in July and August using the new 3G facility at Noak Hill Sports Complex. It's an ideal opportunity to get the players together for some pre-season training and to also work on football skills in a small-side, competitive football environment. Trophies & awards will be made to the winning side and it only costs £20 per match for a 40 minute game of football. For more information and to register, head over to the Essex Alliance League website.